There are plenty of personalities in this sport… but then there’s Blake Baggett. He is the uniquest of the unique. On the track, he’s always a mystery, at times busting out world-beating speed; at other times disappearing in the pack. When he struggles it’s strange, but when he wins, well, that becomes shocking, too. Further, when he does win, he usually comes from behind, the opposite of the way most others riders plan it. But with Blake, being different is being normal, and being normal is different. Likewise, off the track Baggett is his own person. He’s not known for running in the motocross social circles, and he spends a lot of time off the radar. He furthered that this year by staying out of California completely during the off-season and operating out of his expansive El Chupacabra Ranch in Florida. Blake got famous in this sport the same way he wins races—you think about everyone else, you gossip about everyone else, and then—BAM—he interjects himself into the conversation. Oh, and if you try to have a conversation with Blake and figure out what makes him tick, good luck. You can never tell what’s real and what’s a swerve, like the time he told me his wrist was totally jacked up and he wasn’t even going to ride at all until practice at Hangtown (he later told me he was joking the whole time, and was sitting on his bike as he held the phone, having just finished a practice moto). Other times, he’s brutally blunt, to the point where his confidence melds into trash talk. I would assume, to Blake, when he said, “The goal is to break Tomac” a few years ago, well, that was just honesty. That was the goal. But few riders speak like that, so those words sounded like fire. You want more weirdness? Blake is usually under the radar, but when industry insiders start talking about who they’ve seen “flying at the test track” he’s often on the list. Back in 2011, our man David Pingree saw Blake during pre-season outdoor testing and 100 percent guaranteed he would win the Hangtown opener. Blake, at that point, had never even won a national. He went on to win the race. Yet despite all that flying at the test track, we often hear stories of Blake feeling uncomfortable with his bike at the opening round, and then going to work with all manner of bike changes. He was flying at the test track before the 2017 nationals, struggled at round one, changed everything, and was winning by round three. Last year he was flying at the test track coming in to supercross, struggled at the first few races, made tons of changes, and began a podium run at mid-season. Just when you think you have it figured out, though, he will change. This year, Blake told me he’s so happy with his bike that he changed absolutely nothing after round one. He only rode for 10 minutes, apparently, between Anaheim and Glendale. At Anaheim he was first in practice and 12th in the main event. At Glendale he was 15th in practice and first in the main event. Very little of what he does ever makes complete sense. When it all comes together, though, that’s when he has the stuff to beat anyone. For the first time in his career, Blake is a 450SX winner. 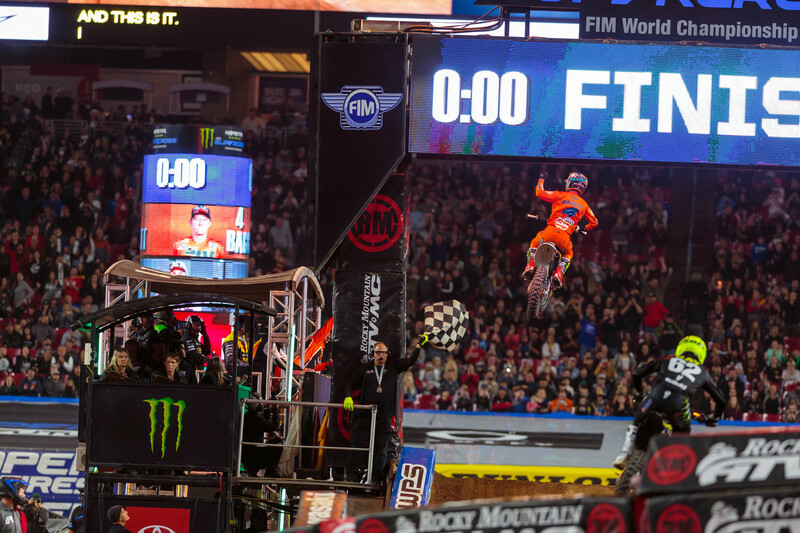 This is also the first 450SX win for his Rocky Mountain ATV/MC-KTM-WPS team. Is it the first of more to come? No way anyone knows for sure. In the meantime, you can try to decode what’s going on in this post-race video with Blake. There’s only one thing that’s certain: there’s no one else like this.